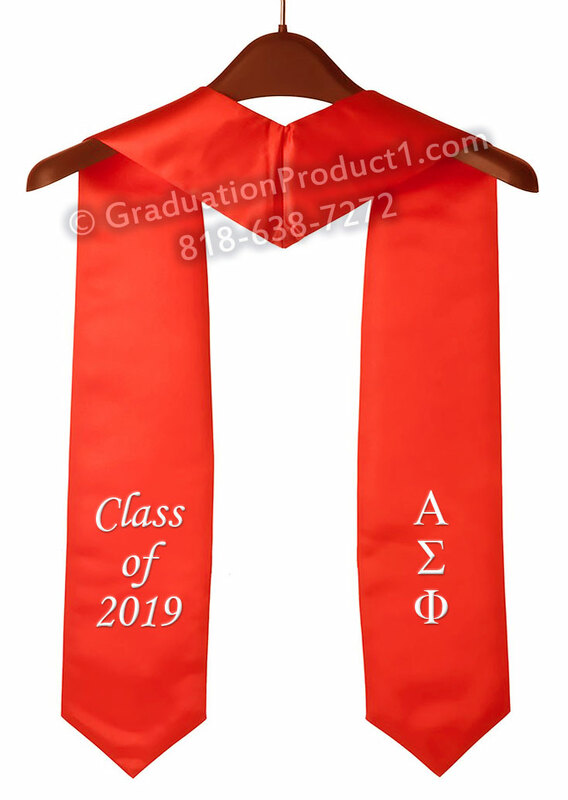 Alpha Sigma Phi Greek Graduation Stole features customizable sewn-on letters placed vertically on the right side of the graduation sash. Customize this stole by choosing your stole color, letters, and letter color. This one-of-a-kind graduation stole is a keepsake that you will cherish forever. Graduation stole is 30.5" long and made from bridal satin. Ordering Process: Select Stole color from Dropdown box and Enter thread color of lettering and personalization text or Greek letters. You can also email us your design later with your order number at sales@graduationproduct1.com. No Setup Charge. Customer Reviews on "Alpha Sigma Phi Greek Graduation Stole"
Write you own review on "Alpha Sigma Phi Greek Graduation Stole"